Could you provide more information about this 2007 Yamaha ZUMA 50 2T? Siegfried's Motorwerx LLC is very excited to offer this super rare find! FEATURING ONLY 158 ORIGINAL MILES! This 2007 Yamaha Zuma 50cc is powered by the LEGENDARY 2 stroke power plant! This scooter is absolutely GORGEOUS! You will NOT FIND ANOTHER ZUMA AS CLEAN AS THIS ONE! Featuring both kick and electric start, rugged suspension, aggressive tires, and go anywhere attitude this ZUMA is ready to take on any challenge! The paint is in great shape and condition. No dings are visible on this vehicle. This vehicle comes with a new set of tires. The interior was well maintained and is extra clean. The exterior was well maintained and is extra clean. The engine is functioning properly and has no issues. This vehicle has no previous collision damage. The transmission shifts very smoothly. The brakes are in great condition. The battery is in excellent condition. 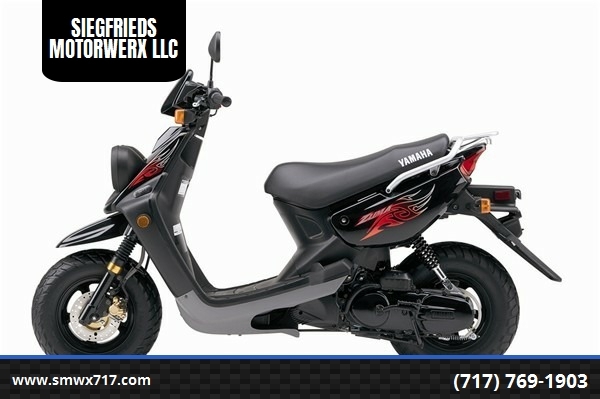 What is the price of the 2007 Yamaha ZUMA 50 2T you have in your inventory? What is the mileage of the 2007 Yamaha ZUMA 50 2T you have in your inventory? I was wondering if this 2007 Yamaha ZUMA 50 2T is still available?